Kitchens are no longer just a utilitarian space, but a diverse living area designed for cooking, entertaining, dining, studying, and more. Is a single overhead light fixture sufficient to meet these requirements? No! Kitchens need a multi-layered lighting design, which ensures you can perform the key tasks of the kitchen while also creating a warm environment for dining and entertaining. A layered lighting design does not have to be complex, and quite often a light fixture serves more than one purpose. The key to creating a lighting design is to find a configuration that fulfills all the functions of your kitchen and complements your home style. Well placed task lighting is essential as it illuminates the key work areas and ensures there is no space hindered by glare or shadows. 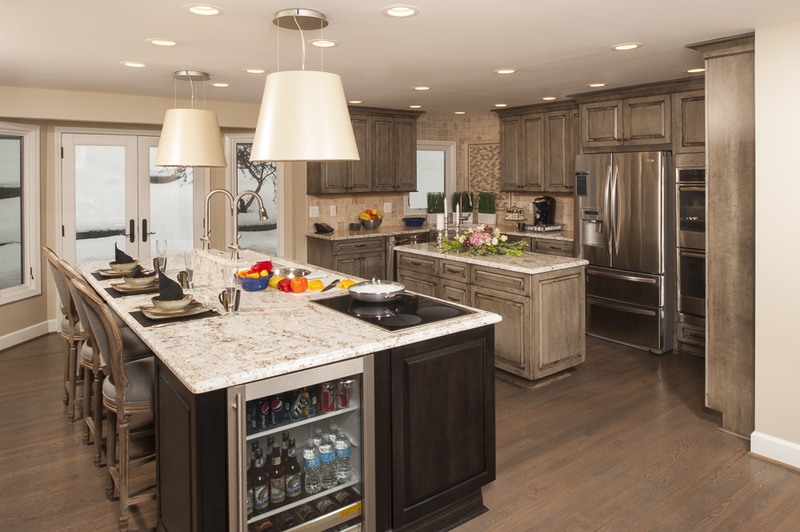 There are certain locations where task lighting must be situated including under cabinets, over the island, by the sink and range, and in designated work or study areas. Any location where you plan to read, chop, or perform key tasks requires sufficient, concentrated lighting to make sure you can see clearly to get the job done. Ambient lighting provides indirect illumination, which adds a human element and makes the room feel warmer and more inviting. The kitchen is the center of every party and often includes seating at the kitchen island and an open plan living area. These activities require the flexibility provided by flush-mounted ceiling fixtures, pendant lighting over the island, or adjustable track lighting. Adding a dimmer switch allows you to change the lighting level and therefore the mood of the room. There are ambient light fixtures to suit every kitchen style as shown in the contemporary kitchen design below left compared with the more traditional design. As the hub of the home, kitchens have become a place to express your style through color scheme, cabinetry, a unique textured tile design, and more. Accent lighting is essential to show off that one-of-a-kind backsplash or your exclusive artwork hanging above the breakfast nook. Accent lights tend to include track lighting, up lighters, wall sconces, or anything intended to spotlight a particular design element. Accent lights inside glass front cabinets can be added to show off your best china and glassware. To make a style statement with your kitchen lighting design, add in decorative light fixtures such as chandeliers, lanterns, or hanging pendant lights. The key with decorative lighting is to make sure that your light fixtures are in proportion to your space and that they suit the style of your kitchen renovation, like the kitchen design pictured to the left. Step 5: Tie it all together! All of these elements work together to create an overall lighting design that ensures all areas of your kitchen are well lit and lighting levels can be altered to meet the requirements of every activity. This does not mean you need a single fixture for every element, as many light fixtures do more than one job. For example, decorative pendant lights over your kitchen island provide task lighting for food preparation as well as ambient lighting when coupled with a dimmer switch. If your budget allows, you may consider including a scene integration system that allows several scenarios to be pre-set with individual lighting levels. After putting considerable effort into your kitchen design, make sure you showcase your new kitchen with a multi-layered lighting design. 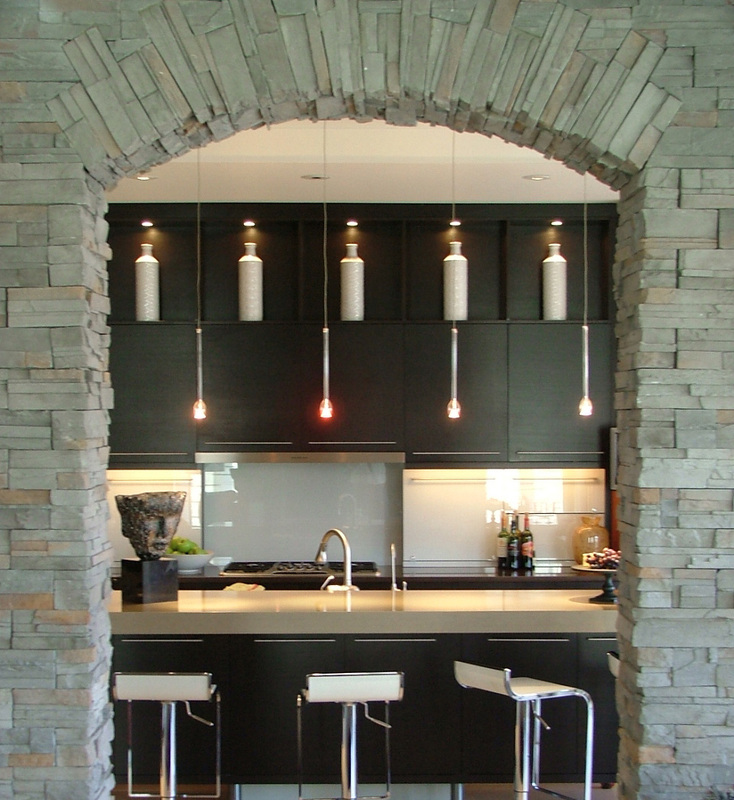 Click here to see more great lighting ideas in our kitchen design gallery.